Mr. Stewart is a lifelong resident of Westmoreland County, Pennsylvania. He is a 1968 graduate of Hempfield Area High School, a 1972 graduate of Penn State University, and a 1977 graduate of the University of Pittsburgh School Of Law. 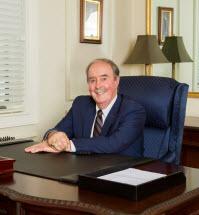 He has practiced law in Westmoreland County since 1977 with offices in Greensburg and Ligonier, Pennsylvania. Mr. Stewart has appeared in multiple editions of the Pennsylvania Super Lawyers, including 2019, which recognizes the top attorneys in Pennsylvania. Only the top 5 percent of lawyers in Pennsylvania are named in Super Lawyers which is based upon a survey of lawyers throughout the state. Mr. Stewart served as law clerk for Judge Charles E. Marker, family court judge of the Court of Common Pleas of Westmoreland County, for 20 years. Mr. Stewart has co-chaired the Family Law and Alternative Dispute Resolution committees of the Westmoreland County Bar Association. Mr. Stewart is certified in Collaborative Law, an innovative approach to dispute resolution that discourages litigation. Mr. Stewart practices law in the areas of family law, business law, estate planning, and real estate. He has participated as a panelist in Pennsylvania Bar Institute seminars relative to family law. Mr. Stewart is a former president of the Board of Directors of the Westmoreland County Bar Association. He is the Past President of the Board of Directors of the Ned J. Nakles Chapter of the American Inn of Court. Mr. Stewart is a member of the Board of Trustees of the Greensburg YMCA and a past member of the Board of Directors of the YMCA where he served three years as president. He has served as Chairman of the Annual Greensburg YMCA Partners in Youth Campaign to raise funds for needy families and individuals seeking services of the YMCA. Mr. Stewart is a member of the Greensburg Foundation Fund Distribution Committee. Mr. Stewart served four years on the Archonate of the International Fraternity of Phi Gamma Delta, two years as board secretary. He currently serves as Vice President of the Board of Directors of the Educational Foundation of Phi Gamma Delta. He also serves on the Advisory Boards of the University of Pittsburgh at Greensburg, the Westmoreland Hospital Foundation Board, and S & T Bank Advisory Board for Westmoreland County. Mr. Stewart is a former president and former member of the Hempfield Area School Board. He has previously served the parishioners of Our Lady of Grace Church as chairman of the Project Management Committee for the construction of the new church at Our Lady of Grace. Mr. Stewart coached basketball, softball and baseball in the West Point, Hempfield Recreation, American Legion and CYO Leagues for more than 30 years. Mr. Stewart is an avid racquetball player. He is married to Karen Dvorsky Stewart, also a lifelong resident of Westmoreland County. Mr. and Mrs. Stewart have seven children.